Audi just showed the world its all-new 2017 A5 Coupé at its headquarters in Ingolstadt, though if you’ve seen the 2017 A4 upon which its based, you probably won’t be surprised by its specs. Audi just lifted the veil off its 2017 A5 Coupé, showing a fascia resembling that of the Audi A4. It’s a handsome design, if a bit sharp and aggressive compared to the elegant, rounded shapes we’ve come to expect from Audi. 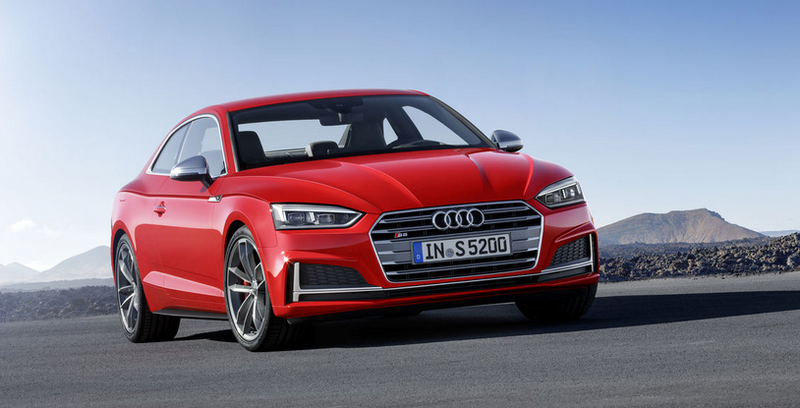 The A5 Coupé will launch in Germany with similar engine options as the A4—three diesel engines and two gas engines, putting out between 187 and 282 horsepower. A six-speed manual gearbox and front-wheel drive comes standard on four-cylinder gas models and on the lower-output 3.0-liter diesel, though a seven-speed dual-clutch automatic and all-wheel drive are also available. The high-horsepower 286-pony 3.0-liter diesel A5, though, comes only with an eight-speed automatic and with Audi’s new blasphemous front-drive based all-wheel drive system, quattro with Ultra Technology. Then there’s the fun car, the all-wheel Audi S5 Coupé, which comes with a 349-horsepower turbocharged V6. Making it a bit less fun, though, is that fact that it comes mated to an eight-speed automatic, and that no manual is available. Still, the all-new MLB evo platform-based A5 and S5 are up to 130 pounds lighter than their predecessors, and have insanely low drag coefficients as low as 0.25, so they should be more efficient, though official fuel economy numbers aren’t out yet. The new A5 is also larger than its predecessor, offering more interior space. Lighter, better aerodynamics, more interior volume—that all sounds good to us. We don’t know which engine options will come to the U.S., or if drivetrain configurations will be the same as Europe, since Audi’s U.S. pricing table—released last month—does seem to show an S5 with a manual transmission as an option. That table shows pricing varying between $41,200 for the A5 Coupe Sport with the 2.0-liter turbo and manual transmission and $61,100 for the S5 cabriolet. EDIT: The U.S. spec next-gen A5 will be a 2018 model, so the pricing table referenced above refers to the current-gen 2017 model A5 and S5. Pricing for new model hasn’t yet been released.